(R.R.P £239.99). A fine quality classic! A most elegant knee-length leather pencil skirt with a smooth clean line and a short kick pleat at the back. Just perfect for smart or smart/casual wear. So versatile and easy to wear with a whole range of tops, sweaters and shirts. Exquisitely tailored in luxury soft smooth lambskin nappa leather, sourced from British hides. It has a figure-hugging fit to emphasise the natural curvature of the body. Length (from waist to hem): 23in/58cm (24in/61cm in the larger sizes). It fastens at the rear with an attractive gold-coloured metal zip plus discrete popper stud. By Ashwood exclusively for the Tout Ensemble label. NOTE: This same style with a kick pleat is available in other lengths – Midi: 27in and 31in; Maxi: 36in (click on links to see each one). Beautiful quality! A chic knee-length black leather pencil skirt with a smooth clean line. 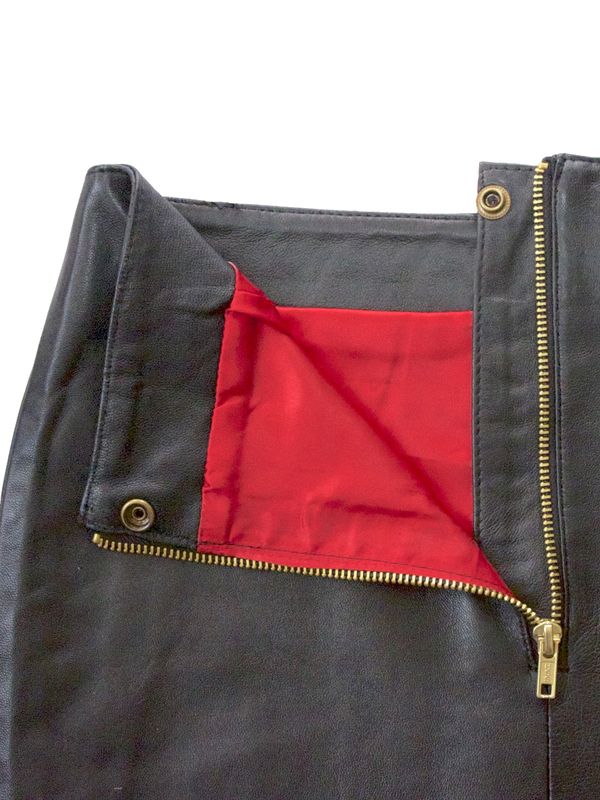 It has a short kick pleat and is fully lined in red satin fabric. Exquisitely tailored in finest quality super soft lambskin nappa leather by Ashwood exclusively for the Tout Ensemble label. 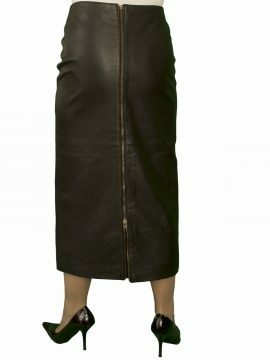 This black leather pencil skirt is just perfect for smart or smart/casual wear and is great to wear with a whole range of tops and sweaters.